Our Abpromise guarantee covers the use of ab65866 in the following tested applications. Human IgE full length protein was purified by Protein L chromatography. As the IgE comes from a monoclonal cell line, there is no contamination of antibodies of other isotypes. The remaining contaminants are mainly components from Foetal Bovine Serum. This product is purified Human IgE with kappa light chains produced in vitro from a monoclonal hybridoma. This antigen is quite unique, because it is the only available IgE product, which originates from a human monoclonal cell line. Our IgE product shows superior advantage when compared to the traditionally purified polyclonal IgE from myeloma patients. A comparison which is highly superior on the following key parameters:. Low endotoxin levels below < 25 EU/mg allow use of IgE protein in cellular immunology and in cell proliferation studies. 1 mg of ab65866 is 380,000± 50,000 IU/ml. IgE is the class of antibodies produced in the lungs, skin, and mucous membranes. It may protect against parasite invasion, but it is a major factor in allergic reactions. The antigen-specific IgE interacts with mast cells and eosinophils, triggers the release of histamine, leukotrienes and other substances that lead to the itching, sneezing and congestion of allergies - and the life threatening respiratory distress of asthma and anaphylactic shock. Lane 1: Molecular weight markers. Lane 3: IgE purified from serum from a myeloma patient. We developed a quantitative and sensitive immunoassay to determine Human IgE in human serum using gold nanoclusters (AuNCs) as fluorescent labels. The synthesized AuNCs have a particle size of 2.7 ± 0.1 nm, a maximum fluorescence emission at 710 nm and high stability. The covalent bioconjugation of these AuNCs with the antibody was carried out by the carbodiimide reaction. A molar ratio 1:3 (antibody:AuNCs) was selected. 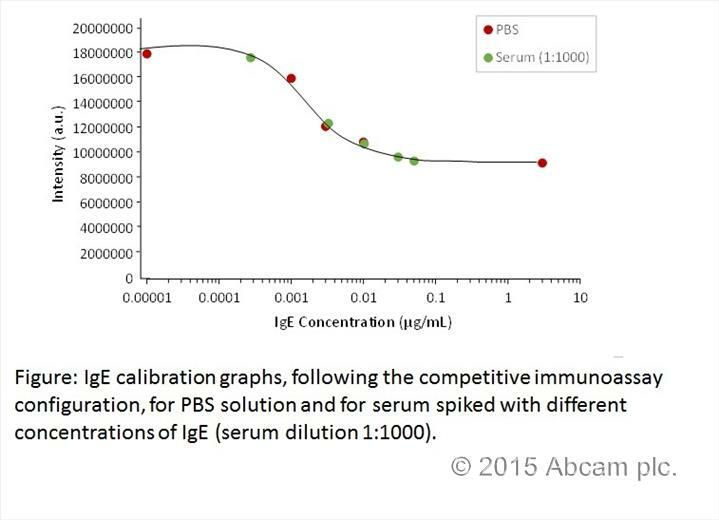 Human IgE from Abcam (ab65866) was used as standard to prepare the calibration curve in PBS and in human serum matrix (attached figure). Two immunoassay configurations were assayed (competitive and sandwich format), obtaining better detection limit with the competitive format (0.2 ng/mL). For both formats the detection limits were better than those obtained with current commercial ELISA kits (12 ng/mL). Moreover, the developed fluorescent competitive immunoassay offers other interesting advantages such as fewer reagents and simpler procedures. The applicability of this new AuNCs immunoprobe was successfully demonstrated for the determination of IgE in human serum, using the competitive configuration. The hIgE works in my assay. But the labelled concentration is different from the concentration measured by BCA method. I recommend that measuring the concenration before using it. What are the masses of the molecular weight markers in the commassie stained gel image for this product? I am looking for an IgE to use as a standard for a quantification assay for a human IgE biotherapeutic. I saw one from yourselves which said it was good for quantification assays, but was 100ug at 1mg/ml. Do you one like this only with a higher concentration as I think the highest concentration on my standard curve needs to be at 2mg/ml, it is for a hplc assay so it would need to be at least a 1ml quantity. I am sorry to confirm we are not able to sell this antibody at 1 mg/ml. I can suggest to consider trying concentrating the protein once you receive it. Please note that as far as we are aware it has not been tested by the application you wish to use. In regards to ab65866, are endotoxin levels measured? If so, do you have the levels available? The lab let me know that they do not measure endotoxin levels in any of their protein solutions and hence they cannot give us a specific value for ab65866. Have you assigned a purity grading to ab65866? I can confirm that ab65866 Human IgE protein has a purity of >95% as determined by SDS PAGE. I am sorry it has not been given a purity 'grading'. Is ab65866 produced from the HE1 clone? Yes, ab65866 is produced from the HE1 clone. How was ab65866 quantified? Was the WHO IgE Serum Standard 75/502 used to standardize? The antigen is produced in a monoclonal hybridoma, and is not purified from blood or anything else, so the concentration is determined by measuring OD 280. It is then sold based on mg/mL and not in units as the WHO standard product. I have a question regarding ab65866. What allergen is specific for this Human IgE protein? The ab65866 Human IgE protein is an affinity-purified, fully human IgE antibody with kappa light chains. The IgE is produced in vitro from a monoclonal hybridoma. The hybridoma is made by purifying IgE producing B cells from a patient with multiple Myeloma and using this to create a monoclonal hybridoma (cell line producing IgE). I can confirm there is no allergen, as the patient suffers from multiple myeloma (non-specific allergic response). Can this protien stimulate mast cells? Yes, this protein can stimulate mast cells.